Elite performer and master instructor, Leslie Rosen brings a lifetime of dance and professional level circus skills to her work. She was honored with the opportunity to perform for the cast of Cirque du Soleil with her ground breaking fire troupe Pyrosutra and accepted into the Cirque du Soleil performer database in Sept 2011 as a solo performer. 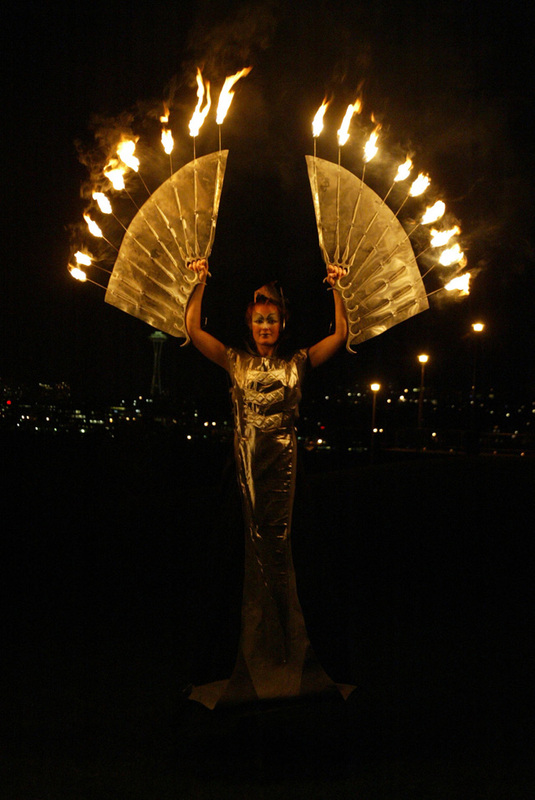 She has created fire performances, stilt walked and bellydanced for everyone from Bumbershoot to Burningman. Appearing alongside national music acts and performing for celebrity clients in major music festivals, TV, movies, magazines and corporate events. Leslie is the co-founder and director of The Black Heart Society and bellydance troupe "The Sirens of Serpentine". A proud native of the great state of Maine, Leslie currently makes her home in Seattle; that is, until the circus comes to town. Leslie's bellydance technique and workout classes are in session now. The next session begins Apr 24, 2019! Check out this review for Leslie Rosen's Bellydancing with Fire Instructional DVD from Guilded Serpent on-line now!